Lately, I’ve been planning what I want to do in the upcoming fiscal year at Microsoft (which starts on July 1). When I first got here in 2013 after a tenure in the agency world, social in our team was simply a siloed organization. Staffed with a few folks and tasked with brand awareness. Only a few in our overall organization wanted to use our services and most requests were for publishing, public relations and narrative amplification. But then a major shift started to happen and has increased in speed that brings us to the here and now. Every team wants our services and not only do they want the basics, they want an education on how they can be better social media marketers and social by design. 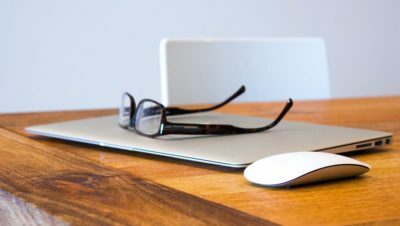 It is no longer satisfactory to list solely skills like Microsoft Office on your resume and think you will navigate the new normal. Companies expect you to know how to use this software. If you want to truly stand out from the pack, you must note that you can be influential with certain niche groups important to your lines of business and understand at least the basics of social media communication and marketing. In my opinion, companies are still not taking full advantage of how social can touch every area of the business by still soloing it or having it only handle the functionality of awareness or PR. Yet, if we look at this “back of the napkin” diagram I drew while thinking one-day eating lunch for 15 minutes before rushing off to back-to-back meetings, social should be touching everything from product development to customer relationship management to customer acquisition to customer retention to corporate social responsibility. 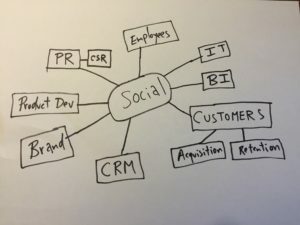 You name it, social is a part of everything in a modern business organization. Before people comment and say what value do social networks bring to business return on investment, you may be possibly missing the meaning behind what I mean by the term “social.” It’s great if your company has a presence on Facebook, LinkedIn, Snapchat or Twitter but those are platforms. What I mean by social is your business or organization is open to conversation and ongoing dialog in all areas including customers, partners, employees, providers, the press, shareholders, philanthropies, etc. This is a very different way to operate a business but is one that is essential to growth in the modern era. While it requires more transparency into all parts of your business, it’s this transparency that allows you to learn faster, see where you should and should not be investing in terms of new developmental areas and be much more approachable from a human standpoint. If this is where the world of business is pivoting it also requires a whole new mindset or group of people working at your company. No longer will a social media team that knows how to use Sprinkles cut it. Nor will PR people who think issuing a press release on situations that are not customer friendly and hoping people will simply forget also cut it. Platforms will come and go, along with job titles and roles, but how you navigate and set up these new systems to succeed are crucial. Everyone is a social employee now whether they want to be or not. The question is, how fast can you get there as part of your overall digital transformation? Basically wished to mention Now I am pleased I stumbled upon your page. Good content you have right here.